North Dakota activates drought hotline to help ranchers find hay and pasture. The drought in the Dakotas may expand in the weeks ahead, according to the latest U.S. Drought Monitor Outlook. 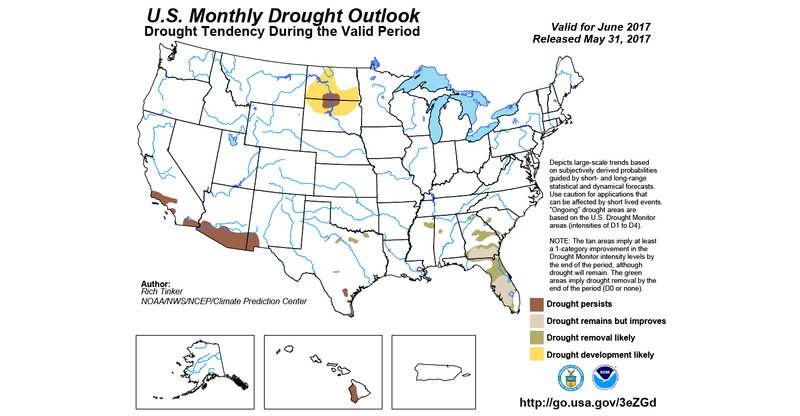 DROUGHT OUTLOOK: The drought is likely to expand in June, according to the latest U.S. Drought Monitor Outlook. The brown color represents areas where the drought is persisting; the yellow is where the drought is expanding. North Dakota Agriculture Commissioner Doug Goehring recently announced a new hotline available for ranchers affected by the drought. Individuals who contact the hotline will provide their name, contact information and what they need or can provide. They will then be entered into the Drought Hotline database to be matched up with other individuals. Goehring said North Dakota Department of Agriculture employees will answer calls to the hotline weekdays from 8 a.m. to 5 p.m. Callers can also leave a message on evenings and weekends. The service is free of charge. 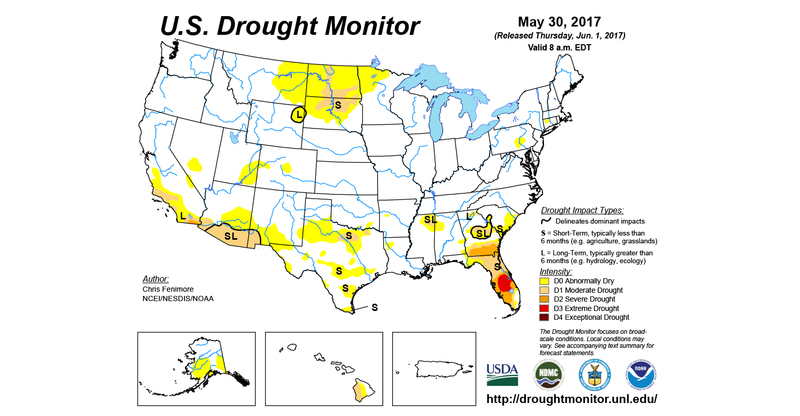 DRY AREA: A large part of the Dakotas was abnormally dry (yellow color), according to the U.S. Drought Monitor’s May 31 report. Lack of measurable rain combined with higher temperatures and wind have caused drought conditions across the state in varying degrees. Based on the latest crop progress report put out by the United States Department of Agriculture for the week ending June 4, North Dakota’s topsoil moisture supplies were rated at 54% short to very short. Pasture and range conditions were rated 70% fair to very poor, which could cut forage production dramatically for livestock producers even if rains were to come in late June.